I'm a big fan of poblano peppers, so when I see them at the farmers' market, I buy 'em. In the past, I've stuffed them, used them in pimento cheese, chili, and in black bean soup. This time, they star in a soup of their own. It's a bit spicy, only somewhat creamy, and overall fairly light. We ate it hot, but it would be lovely served chilled as well. Roast the peppers over a gas flame or on a grill until blackened all over. Put them in a plastic or paper bag to sweat. When cool enough to handle, rub off the blackened skin then deseed the peppers and cut them into strips. Sweat the onion in a bit of olive oil for a minute or two before adding the pepper and garlic. Cook over medium heat for 5-7 minutes, until vegetables are tender. Add the stock and bring to a boil. Turn down to a simmer and add the half and half and seasonings (you can add more to taste, but don't add so much as to overpower the flavor of the peppers). Add salt and pepper to taste and cook for 2-3 minutes more. Remove soup from heat and allow to cool. Place cooled soup in a blender and whiz to puree. 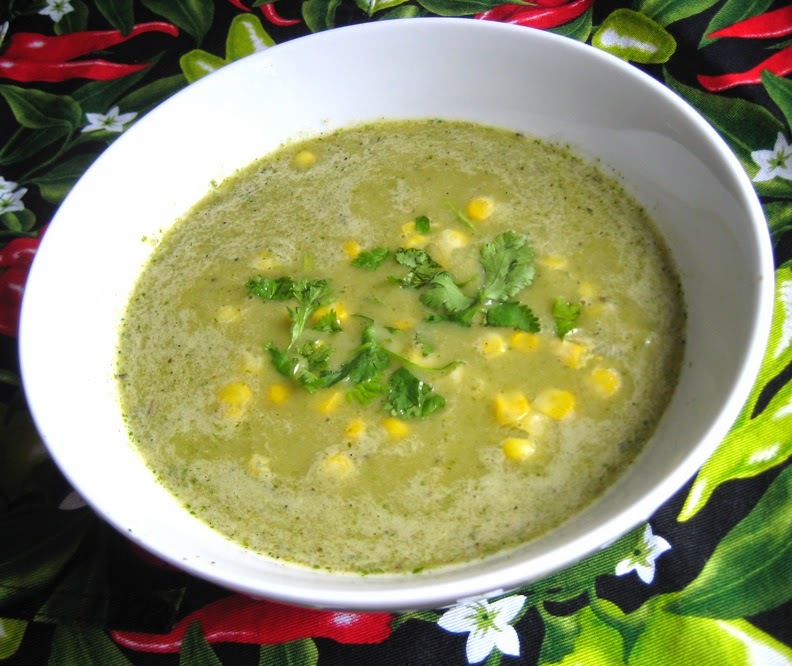 Garnish soup with corn kernels and some cilantro.